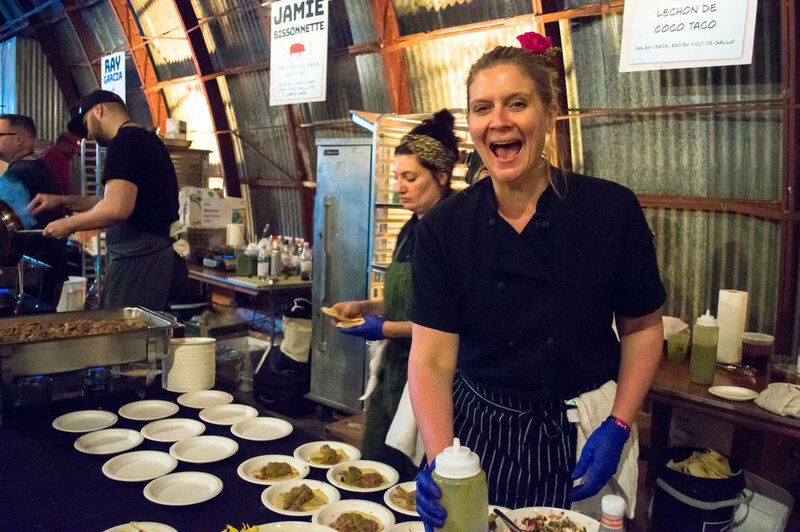 The Austin Food + Wine Festival is pleased to announce the Chef Showcase schedule for the eighth annual festival, and will feature a dynamic roster of more than 100 chefs, restaurants and wine & spirits experts serving samples of signature dishes to festival goers over three days at Auditorium Shores and Fair Market starting Friday, April 26 through Sunday, April 28, 2019. On Thursday, April 25, the pre-Festival Feast Under the Stars will be hosted at Austin’s Auditorium Shores. This five-course, family-style meal will feature a collaborative menu from chefs Michael Fojtasek (Olamaie); Kristen Kish (Arlo Grey); Stephanie McClenny (Confituras Little Kitchen); Grae Nonas (Carpenters Hall); and Nicholas Yanes (Juniper) and wine pairings from Jackson Family Wines, but the festival officially kicks off on Friday, April 26, with Grillin’ and Chillin’ — a hands-on grilling dinner party hosted by Tim Love. This event will offer All-In ticket holders the opportunity to sharpen their grilling skills as they join Love for an interactive night of hands-on grilling, drinks and dinner, all underneath the Austin skyline. Grillin’ and Chillin’ attendees will have their own grill to share with a partner as Love guides them to becoming grilling experts. Grillin' and Chillin' is exclusively included with the All-In ticket. "We are so proud of what we have built over the past eight years with Austin Food + Wine," says festival partner Tim Love. "This is always a weekend to remember, and this year will be no different as we welcome some of the greatest chefs in America to Texas!" On Saturday, April 27, and Sunday, April 28, the festival grounds at Auditorium Shores will come alive with cooking demonstrations, book signings and an interactive area where chefs will cook over live fire pits and offer tastes to attendees throughout the weekend. The Fire Pits will provide interactive experiences cooking with live fire from local and national pitmasters and chefs, including Sonya Coté (Eden East, Hillside Farmacy); Lance Kirkpatrick (Stiles Switch BBQ & Brew); Evan LeRoy (LeRoy and Lewis) and Wayne Mueller (Louie Mueller Barbecue). New this year, Contigo Catering and Friends will offer an expanded fire pit experience helmed by Andrew Wiseheart (Contigo) with more special guests to be announced. "It's an absolute honor to be a part of the 2019 Austin Food + Wine Festival,” says chef Lakana Sopajan-Trubiana of DEE DEE ATX. “I would never have believed it if you told me three years ago that I'd have the opportunity to share my family's food and traditions from my little village! Food always brings me back home, even though I'm on the other side of the world. I'm excited to share the dishes I love and I hope people can experience a real part of Thai history and culture through my cooking, and in a way, become a part of my extended family!" Rock Your Taco, Saturday evening’s signature tasting event at Fair Market, will bring out the competitive side of all participants, with a live musical performance by Jai Malano, an Austin-based singer/songwriter. Chefs will square off against one another to create the ultimate taco, with winners chosen by an esteemed panel of judges. Rock Your Taco competitors include: Tatsu Aikawa & Takuya Matsumoto (Ramen Tatsu-Ya, Kemuri Tatsu-Ya); Tyson Cole (Hai Hospitality); Andrew Curren (ELM Restaurant Group); Jason Dady (Jason Dady Restaurant Group); Tiffani Faison (Big Heart Hospitality);Sarah Grueneberg (Monteverde); Antonia Lofaso (DAMA, Scopa Italian Roots, Black Market Liquor Bar); Tim Love; Fermín Núñez (Suerte); Aarón Sánchez (Johnny Sánchez); Chris Shepherd & Nick Wong (UB Preserv); Nancy Silverton (Mozza Restaurant Group); Max Snyder (Pitchfork Pretty);Jonathan Waxman (Barbuto, Jams, Brezza Cucina, Adele's); and Andrew Zimmern (TV Personality, Lucky Cricket). The All-In ticket is $650 and includes Saturday and Sunday Festival access, over 40 culinary demos, beer, wine and cocktail tasting sessions, access to the expanded Fire Pits, all-day access to the Grand Taste Pavilion, including the Chef Showcase, a special Sunday Gospel Brunch, Grillin’ and Chillin’, and entrance to Saturday night’s Rock Your Taco. The Weekender ticket is $250 and includes Saturday and Sunday Festival access, more than 50 culinary demos, beer, wine and cocktail tasting sessions, access to the expanded Fire Pits, all-day access to the Grand Taste Pavilion, including the Chef Showcase, and a special Sunday Gospel Brunch, but does not include access to Rock Your Taco. All-In and Weekender tickets can be purchased at www.austinfoodandwinefestival.com/tickets. Try to find us as the festival to get in our highlights album.